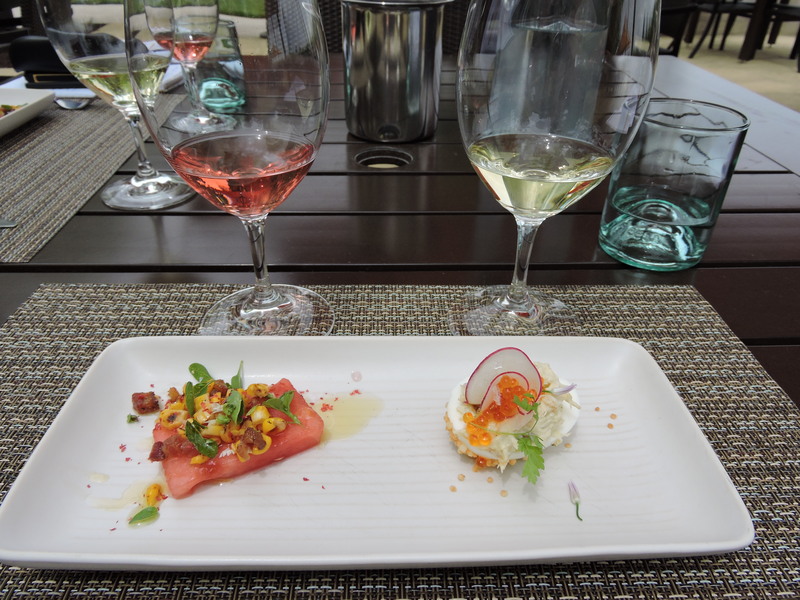 Welcome back to the final blog in a series on small town Sonoma wine tasting. If you missed the prior articles, you can catch up here. With 25 tasting rooms right in town, it was hard to choose and certainly not enough time to cover them all! But I have one more to share with you, located in the Ledson Hotel, on 1st Street East. 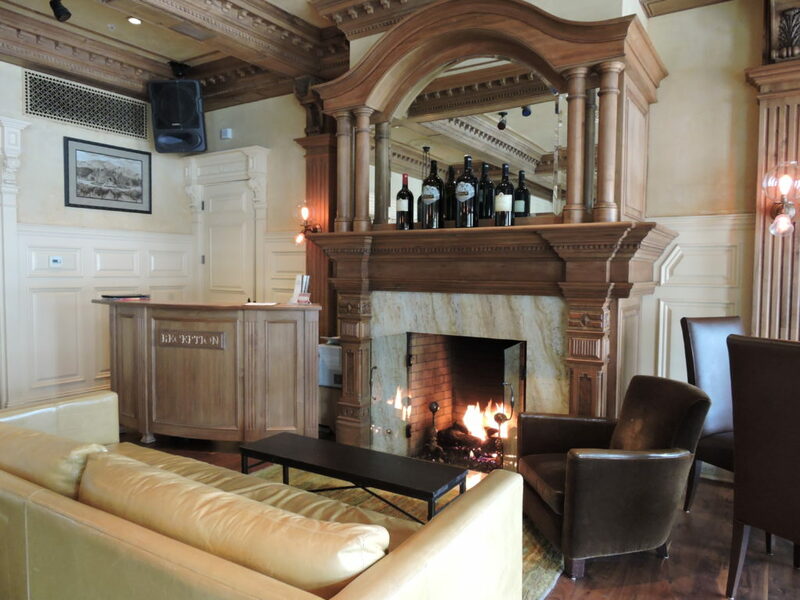 The lobby of this historic hotel transforms into a comfortable lounge around a glowing fire (most welcome on the cold day we were there) and a long bar with chairs along the side wall. 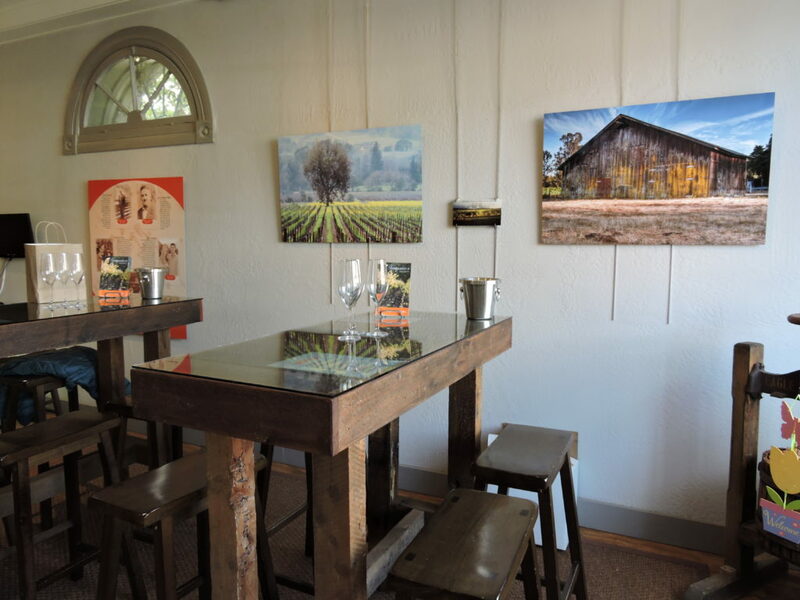 The tasting room offers samples of wines from Ledson Winery and Zina Hyde, with plenty of chardonnay options. My favorite was the Ledson 2015 Russian River Chardonnay Reserve. A little pricey at $52.00, but this full bodied, creamy wine was delicious with subtle notes of toasted oak in the nose. 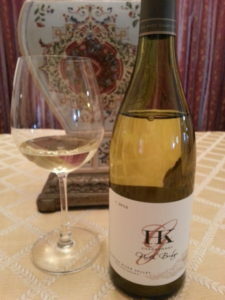 The palate was layered with hints of crème brulee and butterscotch, typical characteristics of a Russian River chardonnay. 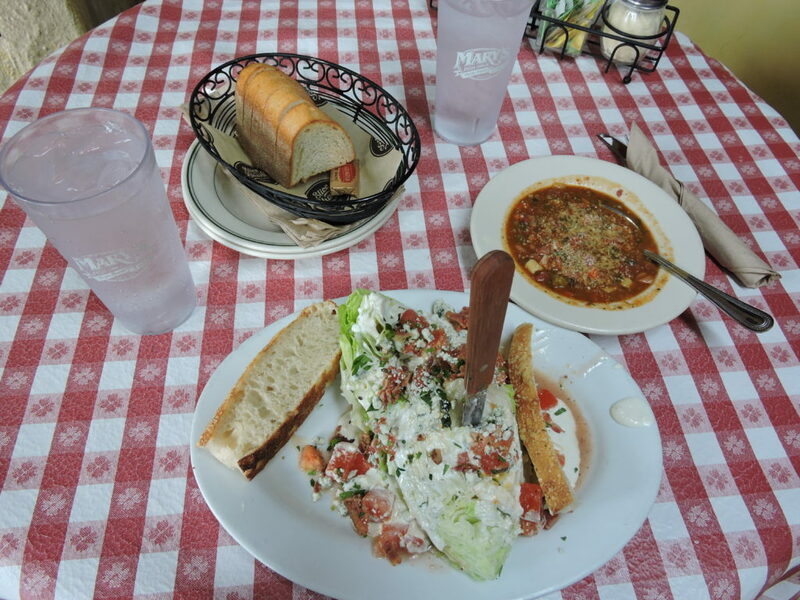 Mary’s Pizza Shack at 8 West Spain street, a chain restaurant in Northern California, might not be your top choice in this town full of gourmet restaurants. But the fire on the patio drew us in on a cold, rainy day and we’re glad we stopped by. The menu is full of Italian and comfort food options, but the wedge salad was one of the best we’ve ever eaten. Drizzled with Italian and chunky blue cheese dressing, topped with tomatoes and bacon, focaccia bread on the side, this was the perfect size lunch. Gary ordered a bowl of their homemade minestrone soup with ham. Also, delicious! Sonoma Grille and Bar, at 165 W. Napa Street, frequented by locals and tourists alike, was packed on this cold, rainy night in the middle of the week. Thinking that was a good sign, we stopped in there for dinner on our second night. Seafood and steak are both great options at this place. The fact that our server from the Lake Sonoma wine tasting room earlier that day was dining there that evening just confirmed our guess about the quality of the restaurant. The vibe here is comfortable and wait staff super friendly. 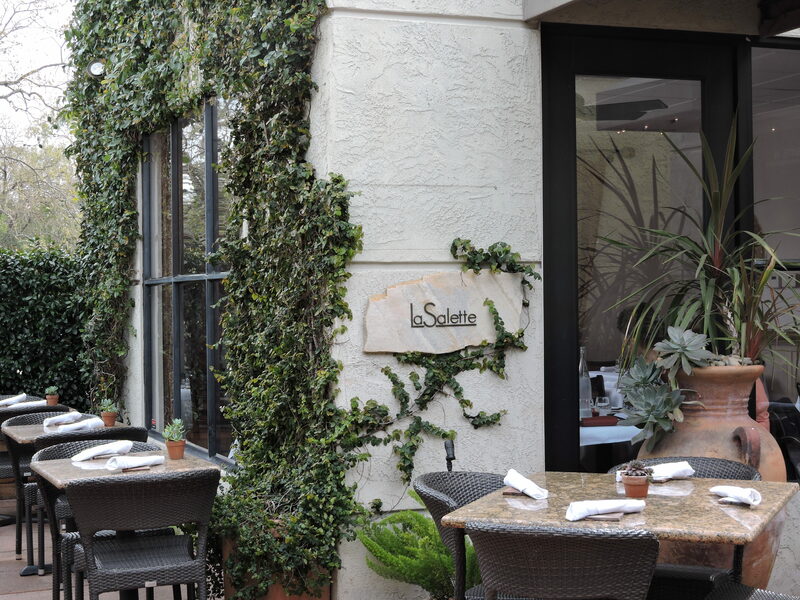 A handful of window seats make this place a little more fun – people watching while eating and dining. The restaurant includes a bar with ten seats that were fully occupied with locals enjoying a conversation, hand crafted cocktails, and appetizer plates of crispy calamari, cheeses and artichoke topped flatbread. For overnight stays, there are plenty of hotels on the Plaza or within nearby walking distance including MacArthur Place, a 64-room luxury hotel and spa just four blocks from the Plaza; the Best Western Sonoma Valley Inn, just one block from the Plaza; Sonoma Hotel, a 16-room historic boutique hotel on Sonoma Plaza; and Ledson Hotel, a luxury hotel with six guestrooms on Sonoma Plaza. For more information on the town of Sonoma, wine tasting rooms, lodging, and restaurants, visit: SonomaPlaza.com. Now park your car, wander through the historic trappings of small town Sonoma, and enjoy some of the best wines that Sonoma County has to offer. Welcome back to my series about small-town Sonoma! Gary, my favorite wine tasting partner, and I spent three days exploring the town’s many wine tasting rooms in search of the perfect chardonnay. If you missed Part One or Two, you can get caught up here. With 25 tasting rooms in easy walking distance of each other, it’s easy to be overwhelmed by choices. We visited several, but by far, my favorite was Bennett Valley Cellars. 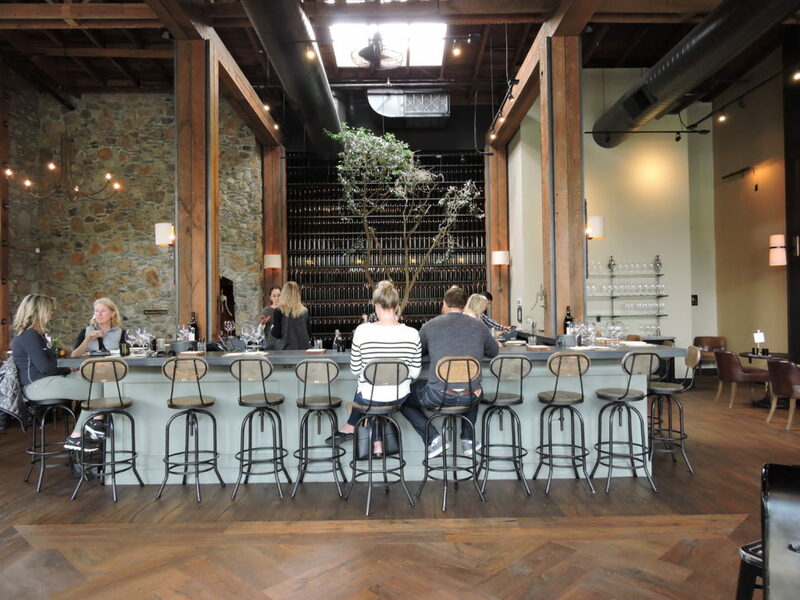 Located at 127 E. Napa Street, this small but comfortable tasting room features bar stools at a long white L-shaped bar, as well as three nearby tables available for seated tastings. We cozied up to the bar and quickly got to know Iliana from Italy, a lively and knowledgeable hospitality hostess. California State Route Highway 12 traverses Northern California’s iconic Wine Country and cuts directly through the town of Sonoma, turning westward at the Sonoma Plaza. Naming a winery Highway 12 then strikes me as perfectly appropriate. With a tasting room located just off the southeast corner of the plaza, tucked into a retail store in a glass fronted building, Highway 12 offers a rare opportunity to sample complimentary tastings of premium wines. Reserve wines have a tasting fee, but it’s waived if you purchase. With no chairs for seating, this is old fashioned, “belly up to the bar” wine tasting by the glass. But I found it worth standing around for when I tasted the three chardonnays they produce. I loved the Carneros Highway Chardonnay. At just $19.50 a bottle, this one came home with me! For dinner we headed to The Girl and the Fig. Popular with locals and tourists, this locally owned restaurant is famous for its Cal-French gourmet food. 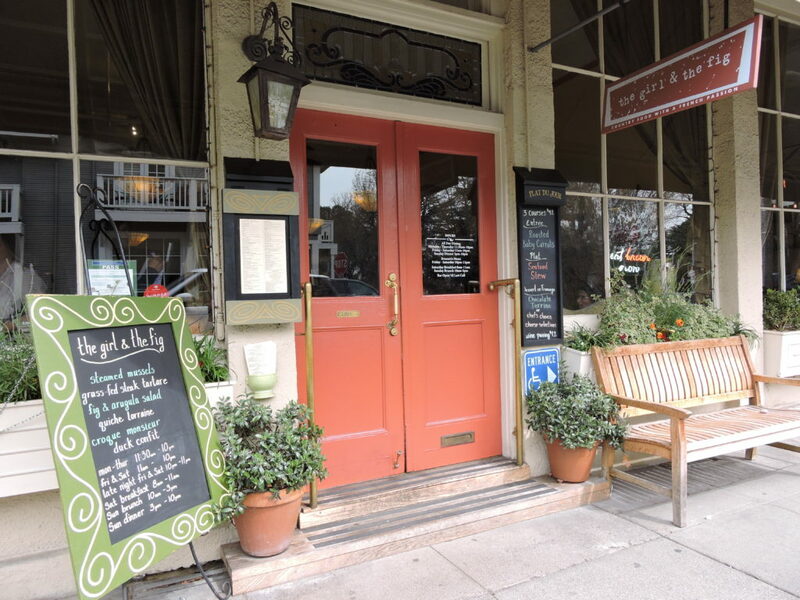 Just across the street from the northwest corner of Sonoma Plaza, this restaurant has been serving fine, farm-to-table country French entrees for over 20 years. Proprietor, Sondra Bernstein, specializes in pairing “Rhone-alone” wines with her Sonoma-French cuisine. Wine flights are served in a quirky assortment of water, wine and compote glasses, and provide an opportunity to sample more wines from Sonoma County. 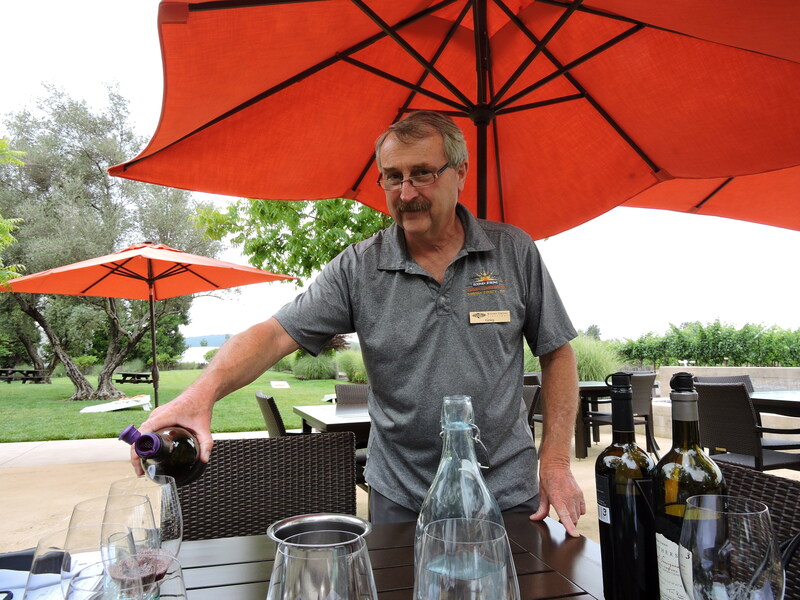 In Part 4, and the last of this series, I’ll share one more wine tasting room to visit, and places to stay. Be sure to sign up for my distribution list or follow me on Twitter (@chardygirl) and I’ll let you know when the next in the series is out! Until then, I’ll keep on the hunt for the “perfect” chardonnay. Welcome back to my series about small-town Sonoma! We spent three days exploring the town’s many wine tasting rooms in search of the perfect chardonnay. If you missed Part One, you can catch up with it here. With 25 tasting rooms in easy walking distance of each other, it’s easy to be overwhelmed by choices. 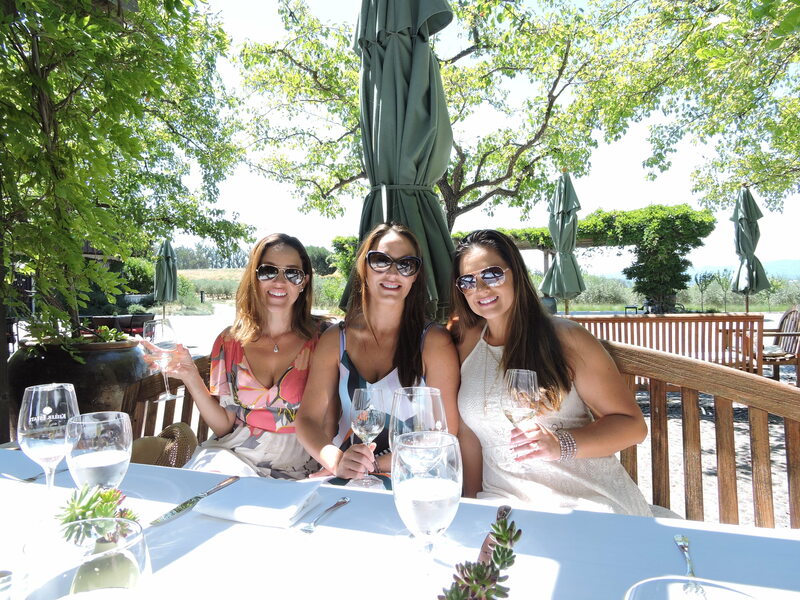 We loved our first stop at Lake Sonoma Winery, but it was time to find lunch. 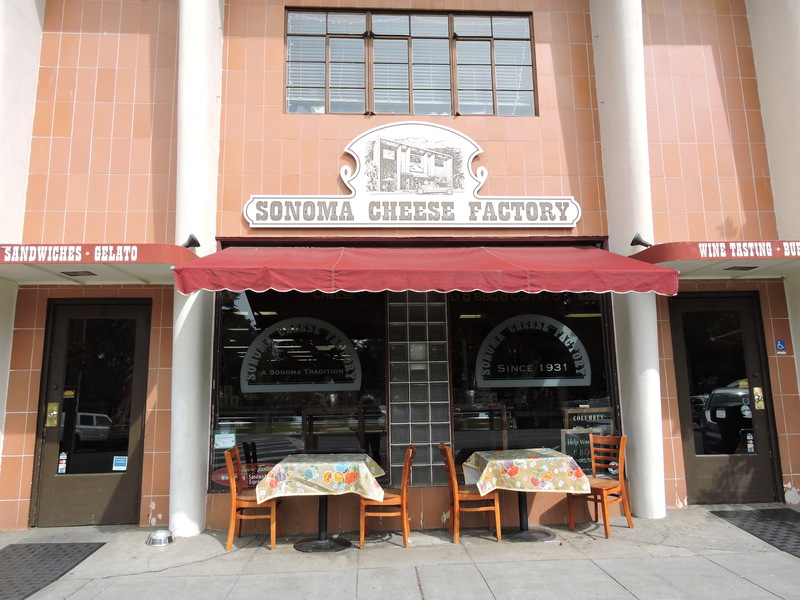 Just on the other side of the Plaza, we stopped by the Sonoma Cheese Factory, specializing in authentic barbeque, on 2 Spain Street. The pulled pork sandwich caught our attention and was just as delicious to eat as it looked on the plate. Sonoma Cheese Factory also offers wine tasting. You can enjoy a flight of wines if you want to sample more of Sonoma’s offerings or just order a glass of local wine with your lunch. A gourmet store as well, this place is perfect for putting together a picnic lunch. In business for over 85 years, it’s easy to see why this place Is so popular. 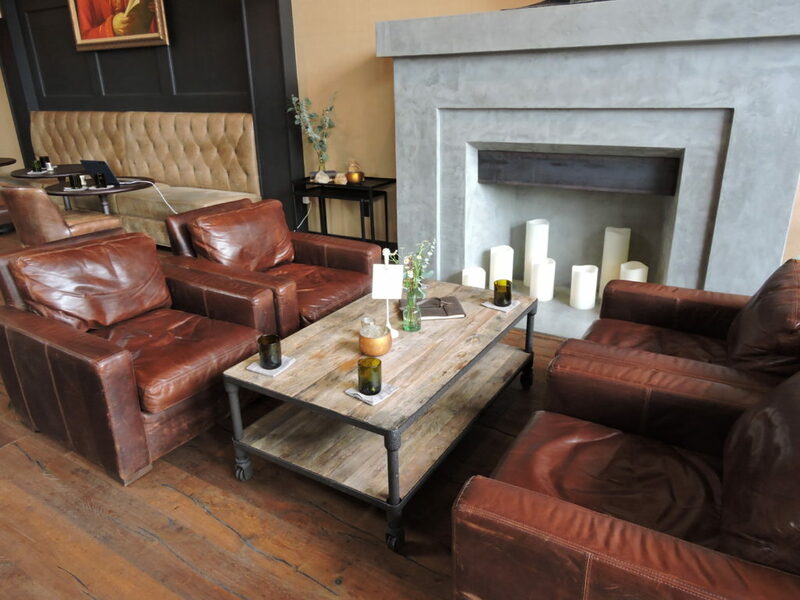 Next, we headed to Pangloss Cellars Tasting Lounge, at 35 East Napa Street. Housed in a refurbished building built in 1902, the tasting lounge is cavernous. Visitors can relax at the large tasting bar in the back of the room or enjoy food and wine pairings in the vintage arm chairs and couches nested around coffee tables along either side of the room. At the back of the room, facing the tasting bar, is a dramatic wall of wine bottles. The lounge itself is handsomely appointed. Rock walls, rustic timber supports, exposed beams in the ceiling, and wood floors harken back to the building’s original purpose – a general store. Seated at the tasting bar, we were served by the knowledgeable and gracious, Allisa. 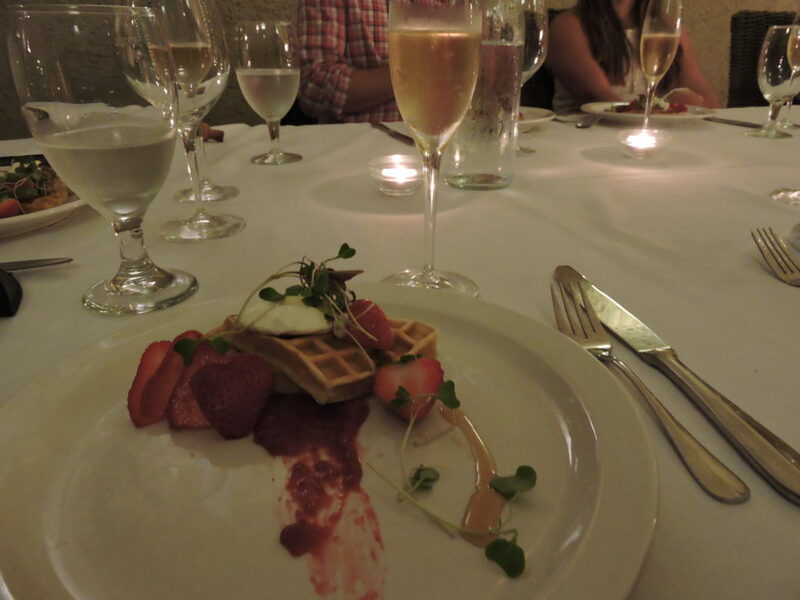 The tasting fee was pricey, at $25 per person, but the experience was well worth it! Plan to spend the afternoon here – as the pace is relaxed, educational, and the tasting menu generous. We tried the 2015 Chardonnay made with 30% new French oak. As Allisa, explained, the winemaker doesn’t like “a stick of butter or an overly oaked chardonnay” so he doesn’t do anything to affect the malolactic fermentation. Whatever happens, the winemaker lets it happen naturally. 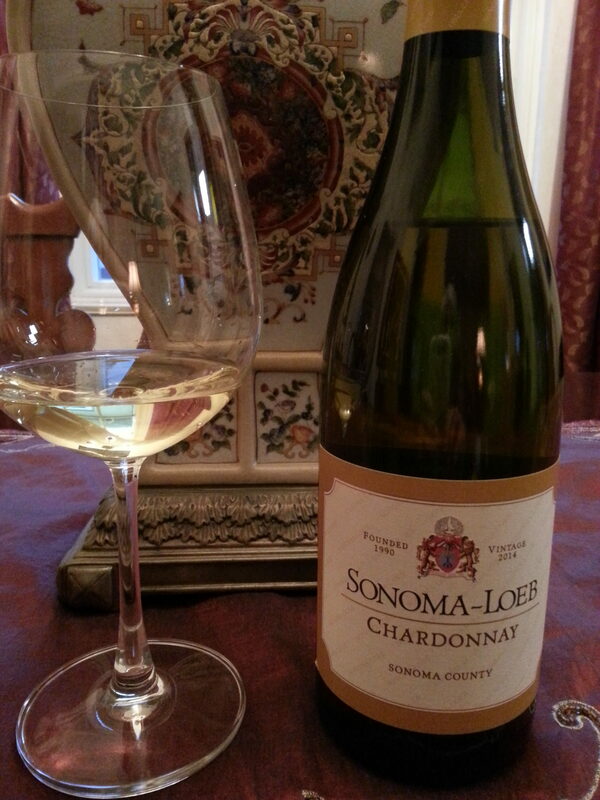 With a clean nose, this chardonnay is bright and crisp but still creamy and lightly oaked. 376 cases produced, the wine retails for $35. After nearly two hours enjoying a delightful tasting experience of whites and reds, it was time to think about dinner. That evening we dined on gourmet Portuguese cuisine at La Salette, 452 First Street East, a popular restaurant. We added the optional wine pairing with dinner. Generous pours, perfectly paired with the appetizers, entrees and dessert, allowed us to sample more Sonoma County wines and provided an extra special dining experience. I do recommend making reservations in advance as this sophisticated, tile-mural trimmed bistro has quite a local following. After dinner, a leisurely stroll around the Plaza was the perfect way to end a perfect day. 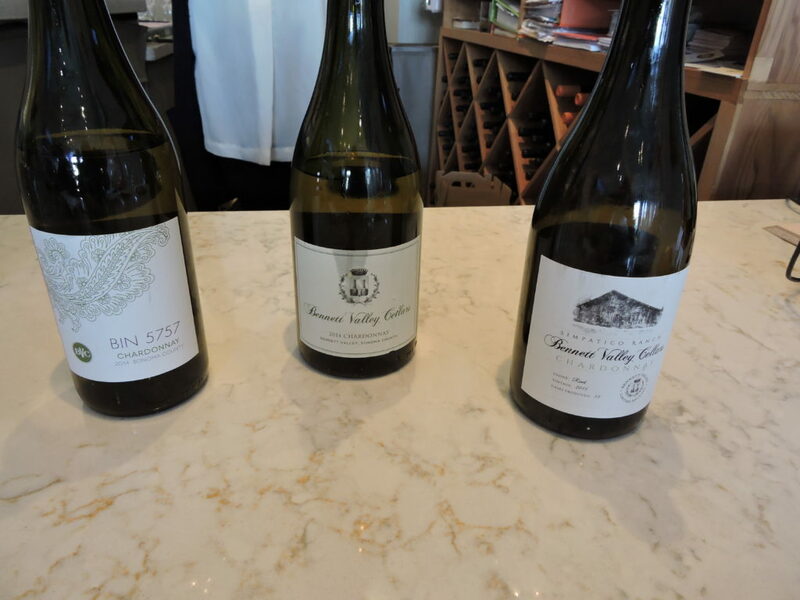 In Part Three of this series, I’ll tell you about two more delightful wine tasting rooms that I highly recommend and why, plus another restaurant that you’ll want to try! Cruising down the Rhone River on a wine themed river cruise was a great way to see the South of France and taste the wines of Provence. But we were even more fortunate to be sailing on a wine-themed cruise sponsored by the Petaluma Gap Winegrowers Alliance out of Sonoma County. 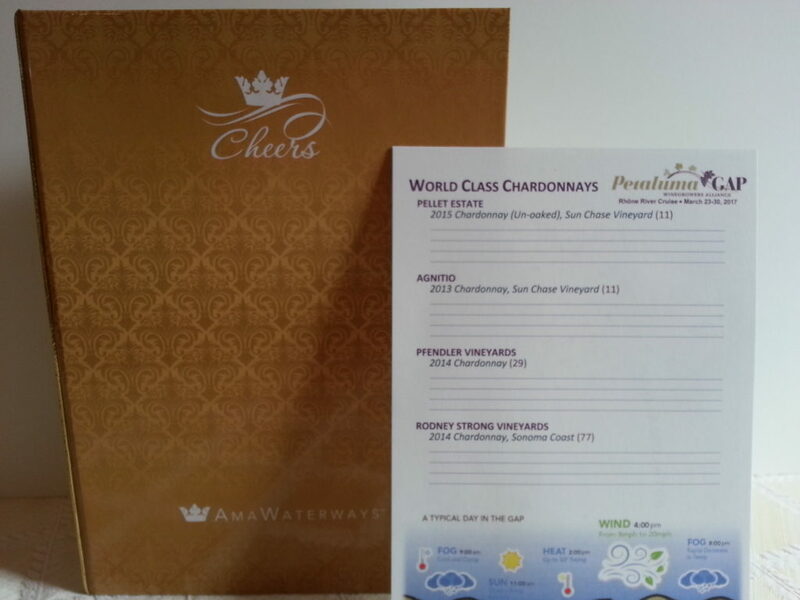 To promote its efforts to become their own designated appellation and raise a little money, the Alliance sponsored the cruise and sent along several cases of wine supplied by 12 wineries from within Petaluma Gap. The Alliance also sent four winemakers to represent the Gap, educate guests on the ship, conduct wine tasting sessions, and host winemaker dinners. Lucky me, one of the first wine tastings featured four chardonnays from the region. First on the tasting menu was a Pellet Estate 2015 chardonnay, unoaked from the Sun Chase Vineyard. If you’ve been reading my blog for a while, you already know that I lean towards chardonnays that are barrel fermented. 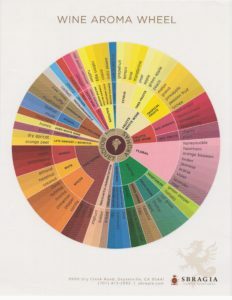 But, I’ve tasted a few unoaked versions lately that have opened my eyes and palate a bit. The beauty of the unoaked chardonnay is the flavor of the fruit comes through and this Pellet Estate is no exception. Aged 8 months in stainless steel, the wine was clear and shiny with lemon yellow hues. The nose offered hints of pear, apple and pineapple aromas. The high fruit flavors of citrus, apple and pineapple were layered with a hint of almond and melon. It finished with depth and complexity. Alcohol is 14.5%. The wine retails for $36 at the winery. Next, we tasted the Agnitio 2013 Chardonnay, also from the Sun Chase Vineyard. This turned out to be my favorite. I was very pleased and surprised when a bottle of this showed up in our cabin later, thanks to the generosity of the winemakers. This is Agnitio’s first vintage of Sun Chase Chardonnay. 100% fermented in oak barrels, this wine displayed the luscious Sonoma County chardonnay flavors that I love. The nose expressed aromas of lemon, white flowers, and pear and vanilla. A wine more full bodied than the Pellet, the mouthfeel had depth and complexity. There was some minerality in the flavor, layered with pear, vanilla and a hint of butterscotch. Alcohol is 14.1% and the wine sells for $40 at the winery. Pfendler is a small production winery that only has three wines in its current release, producing just 400 cases of this chardonnay. Aged 10 months in French oak, the Pfendler was a beautiful wine with aromas of honeysuckle, apple, spice and lemon crème. The mouthfeel was lush and the color bright golden straw. The wine was layered with flavors of lychee, pear and a touch of minerality. Alcohol is 14.1% and it retails for $8 at the winery. 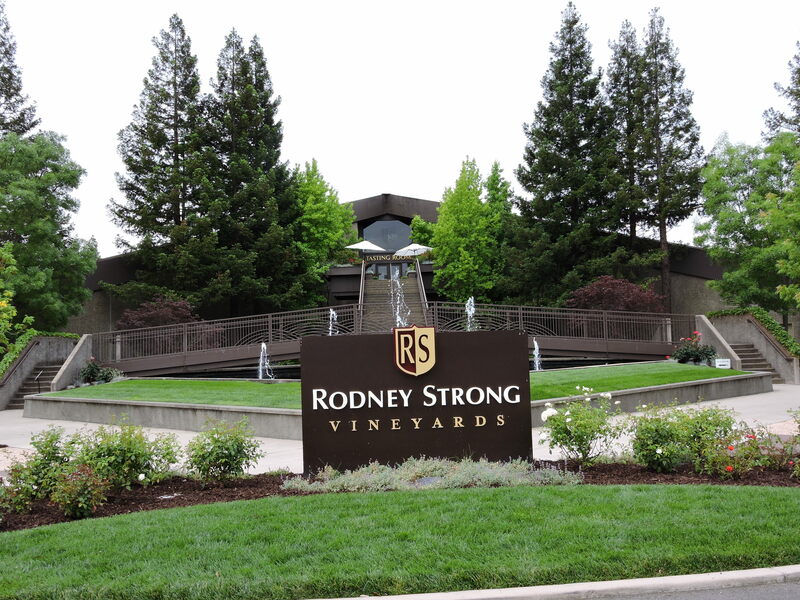 Rodney Strong makes several different chardonnays and is one of my favorite Sonoma County wineries. Barrel fermented in new French oak, the wine had aromas of toasty vanilla, apple and pear. The mouthfeel was rich and creamy, with flavors of pear, pineapple and a touch of spice. This was my second favorite in the tasting. 14.0% in alcohol, the wine retails for $25 at the winery. Makers of several different chardonnays, Sonoma-Loeb has been described as one of the premier white wine makers in Sonoma County and recommended to us by a wine server at Passagio. Although we didn’t get a chance to stop by on our recent trip to the small town of Sonoma, Sonoma-Loeb also has a tasting room in the same “wine alley” as Passagio, just off the town’s main square. This limited production chardonnay, hand crafted in small lots, fits the profile of my kind of chardonnay. There are hints of mild oak and pear in the nose. The wine is soft, round and elegant with a lush, full flavored finish. The body is balanced, polished, clean and well made. After tasting this wine, I think it’s worth a return trip to taste a few of Sonoma-Loeb’s other chardonnays, especially their reserve chardonnays. But if you can’t make it over to Sonoma anytime soon, you can pick up a bottle of this at Total Wine for $18.99. 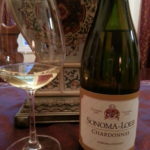 Not too bad for a quality bottle of Sonoma County chardonnay. Last on our tour through Sonoma County and the search for exceptional wine tasting experiences was Keller Estate. Located in the southern part of Sonoma County off Lakeville Highway, this Petaluma Gap winery is open by appointment only (although a quick phone call ahead usually gets you in right away, 707.765.2117). When you arrive, expect to be seated, not ushered up to a crowded winetasting counter. The feel here is luxurious and the pace of wine tasting is leisurely. Knowledgeable wine servers share information about the winery and serve popcorn popped in the winery’s estate produced olive oil, with a side of olive oil for dipping. While this might seem like an unusual pairing for wine tasting, the olive oil is quite delicious and the popcorn and olive oil flavors don’t detract from the wines. Our first visit to Keller was exactly this kind of experience. 90 minutes tasting four wines in the tasting room, overlooking the vineyards and learning about the chardonnays, pinots and the Rotie being poured that day. But our return visit was so amazingly over the top and indulgent that I would happily repeat the experience. Called their Serenity and Wine Brunch, this is a three course, gourmet feast paired with estate wines. For $65 per person or $50 for club members, this is an excellent way to sample the Keller wines. Brunch is served on the Vineyard Terrace with sweeping views of the vineyards, olive groves and Mt. Tamalpais. Seating is family style at a long, elegantly set table. Be prepared to get to know your table mates as the wine is poured. And, servings are generous! We started with a crisp, dry rose, worked our way through three different chardonnays, sampled a couple of pinot noirs, the Rotie and ended with a sparkling wine. We even received a special treat at the end. With temperatures hovering around 100 degrees that weekend, Brian, our host, had set up the wine cave earlier in case we needed to sit inside. 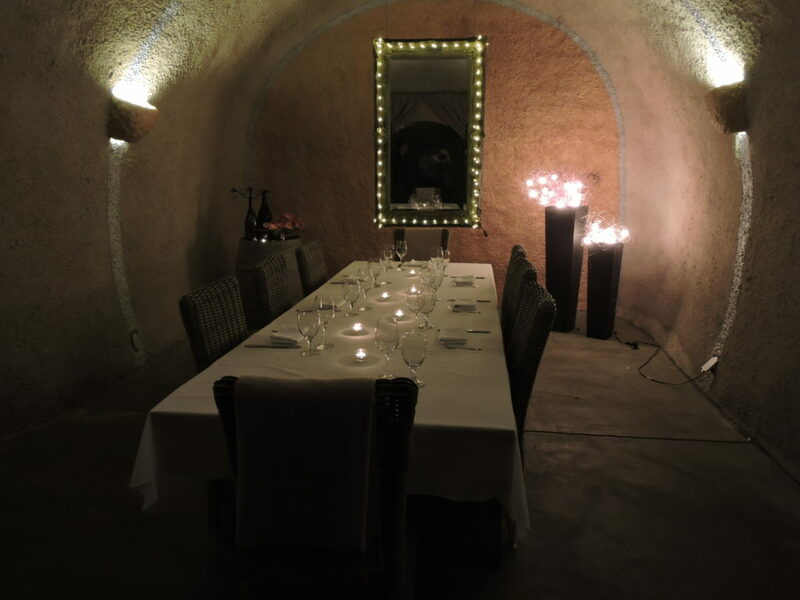 While we did enjoy most of our meal on the vineyard terrace, Brian kindly invited us back to the cave to cap off the afternoon with dessert and sparkling wine. We parted ways with our new found friends, purchased some favorite wines, then set off on the road wondering how we were ever going to just be able to walk into an ordinary wine tasting room again and belly up to that crowded bar! So there, dear readers, is the last of our Sonoma County exceptional wine tasting experiences. It was fun. It was indulgent. It gave us unique and up close opportunities to learn more about Sonoma County wines and sharpen our wine tasting skills. Impress your friends or impress your date. Guaranteed that any one of these five experiences will do the trick!